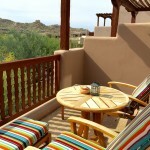 The Four Seasons Scottsdale at Troon North combines adobe architecture with luxurious amenities. 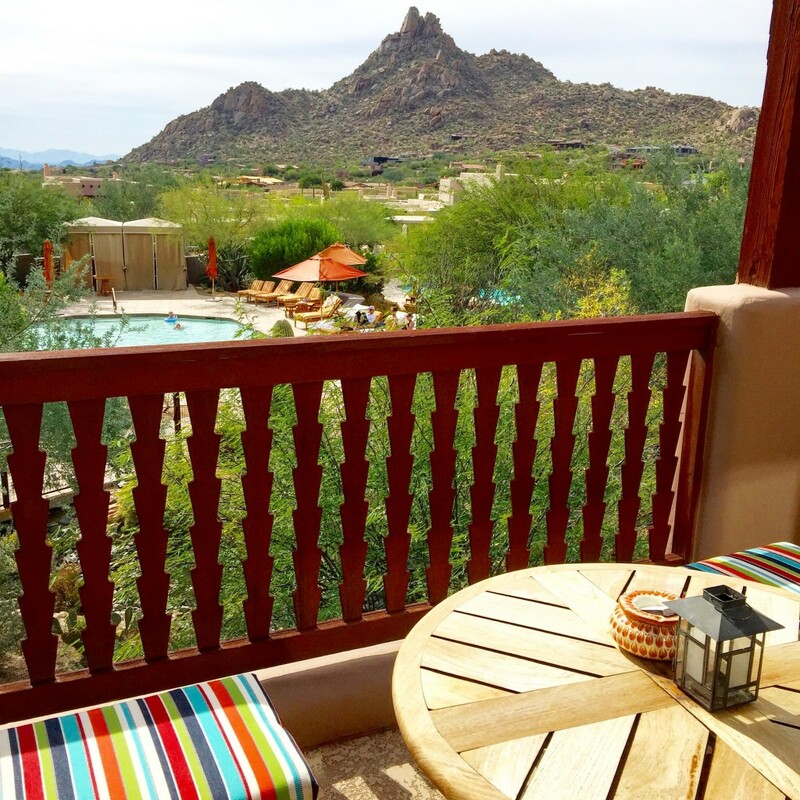 This hotel is a colorful desert oasis that provides a flawless Arizona experience. 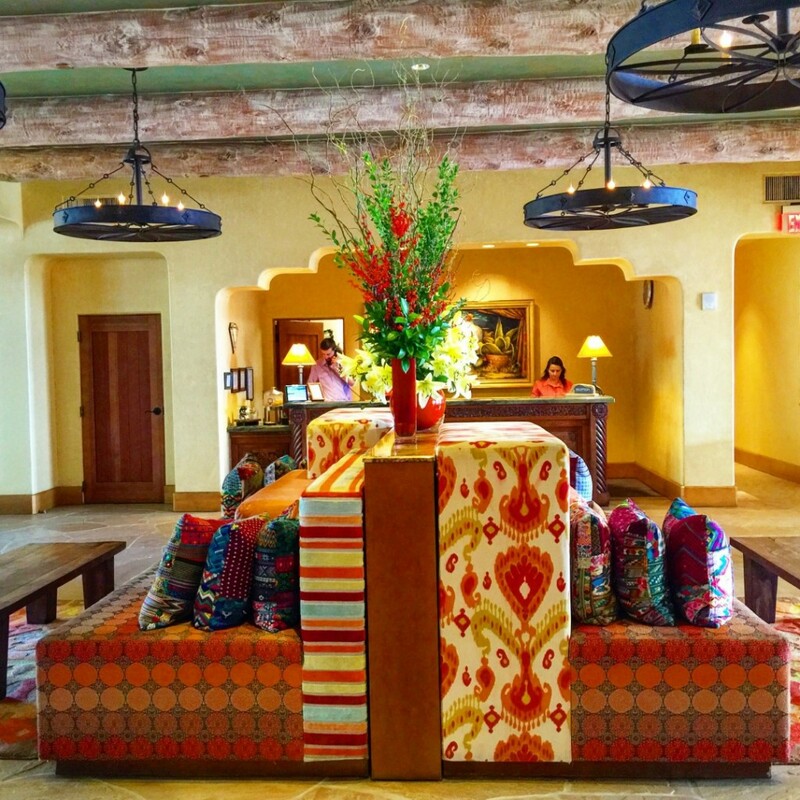 Four Seasons Scottsdale’s lobby is noteworthy. 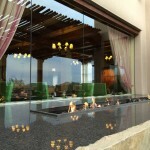 Colorful and spacious with a gigantic sparkling mosaic cactus, it’s an enticing first impression that sets the mood. 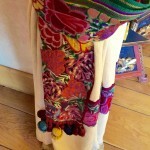 Look at those textiles. Aren’t they gorgeous? 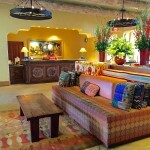 You see this type of color throughout the hotel and the design elements are southwestern chic and fabulous. The staff is friendly and approachable and I recommend a chat with their rockstar concierges for insights and tips about the area. 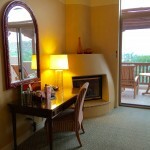 Rooms are comfortable and large. 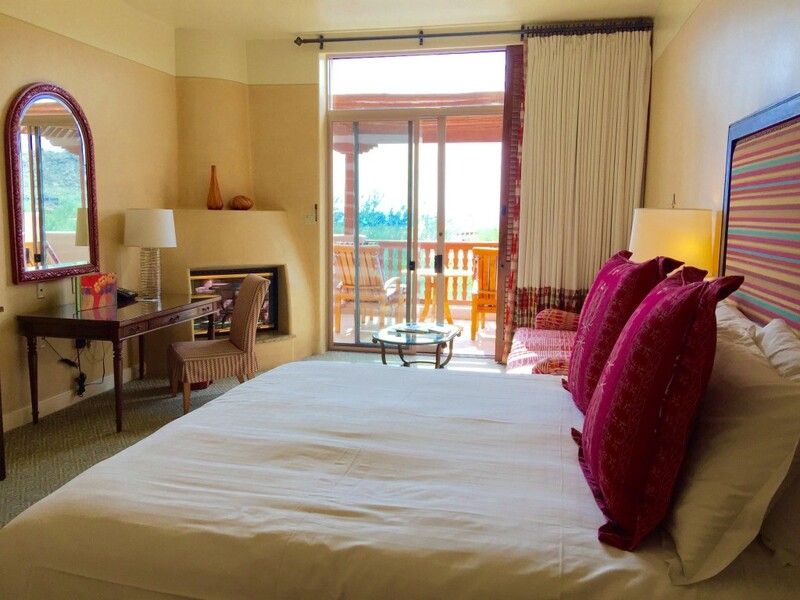 A gas-powered adobe fireplace is cozy at night and the bed, like those at other Four Seasons, is like a cloud with butter soft linens. I never sleep better than I do at a Four Seasons. This was no exception and I love the sliding shutters and heavy duty drapes that make the room nice and dark as well as pin-drop quiet. 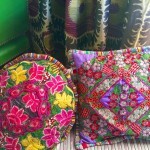 A pretty, bright fuchsia and red couch is a hide-away bed where my son slept. When we came back from dinner, it was all made up and ready to go. He slept great and was comfortable throughout the night. 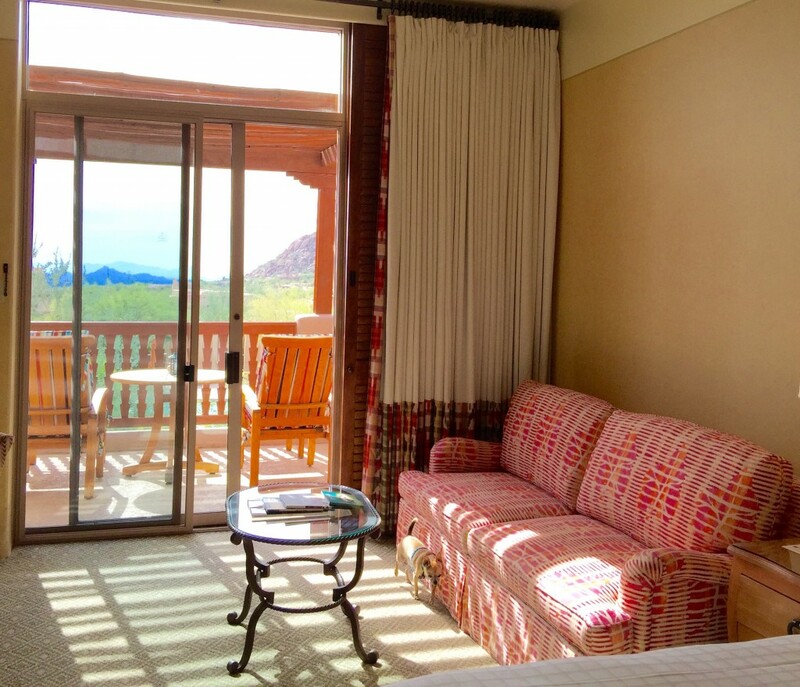 One of my favorite features of the room was the balcony with bright comfy furniture and fantastic views. We had a view of the pool and mountains. It’s relaxing and private. 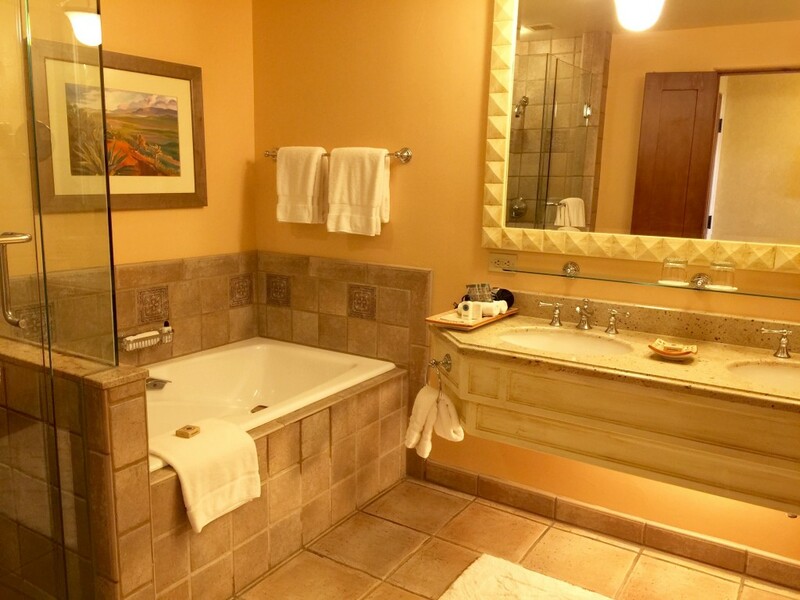 The bathroom has a soaking tub and shower, along with double sinks and plenty of room for two people to maneuver easily. 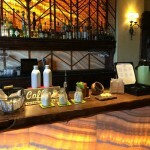 Every morning, there is a coffee bar with fresh muffins and a variety of teas and coffee drinks set up at the Onyx Bar. 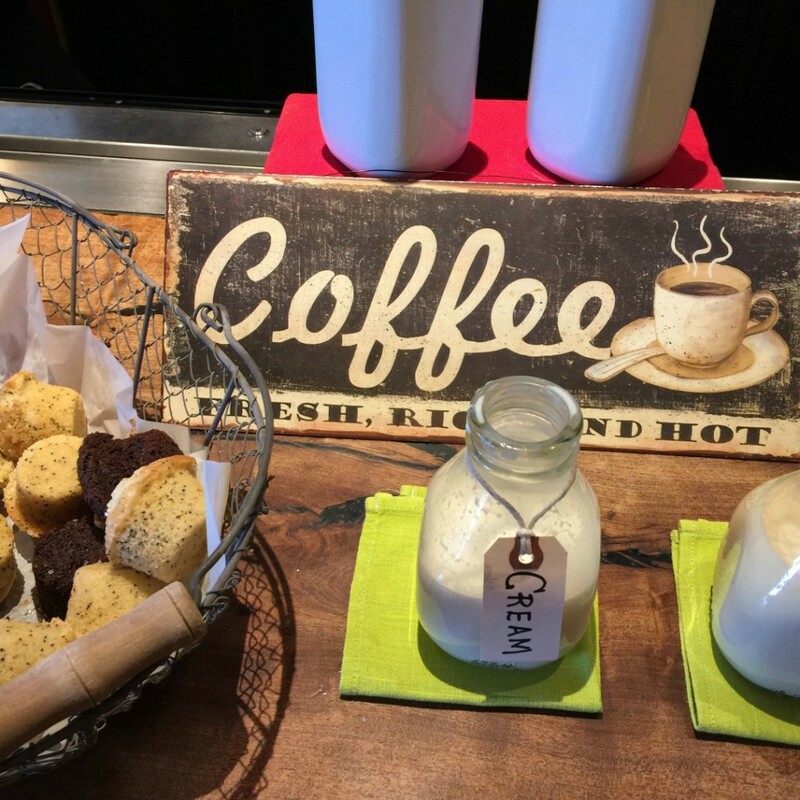 My son was excited to see what type of muffins would be offered each morning, and he would grab a few, I’d grab my coffee and then we would hang out on the terrace and take in the views. What a way to enjoy the morning. The main pool is huge. There are two–one designated for adults only. Cabanas are complimentary, and staff will check on you throughout your time at the pool, offering food and beverages from the outdoor restaurant, Suagaro Blossom, which serves yummy drinks and light fare alfresco. There is something extra fun about having food and drinks poolside, I never get over the thrill of that. We were there during a full moon and the pool was spectacular at night. I swam laps under moon glow and had the pool almost entirely to myself. The water temperature was perfect. 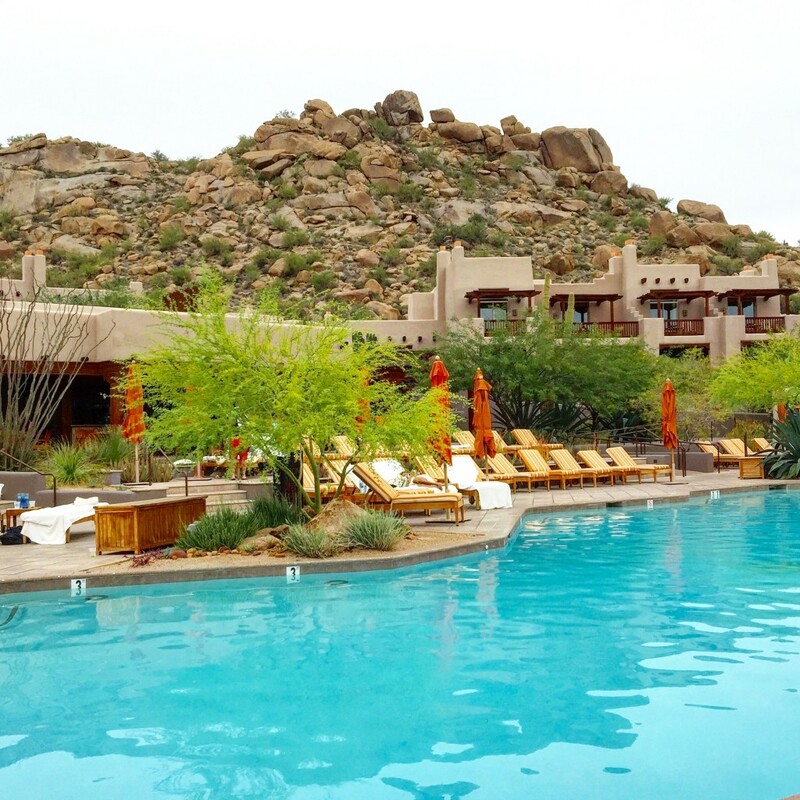 The Four Seasons Scottsdale has a small intimate spa setting that is cozy and quiet. I had a Coco Mole Energizing Wrap and it was fantastic. One of my all-time favorite treatments. 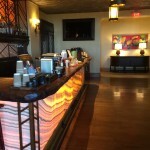 I’ve learned that when I’m at a spa to be more adventurous and try things that are not just regular massages. That way, it’s a special experience. I love scrubs and the Coco Mole starts off with a mocha sugar scrub and then moves on to a mask with coco mole mud rich with antioxidants. Both smell heavenly. This is followed by a scalp massage and Vichy shower. I’d never experienced a Vichy shower before and it was a pleasant surprise. It’s designed so that you don’t have to get up in the middle of the treatment to take a shower. Shower heads run horizontally above you and it is very soothing, you are covered the whole time and can just let go of all stress. 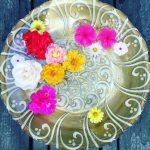 The treatment was very nurturing and revitalizing. I would strongly recommend this. 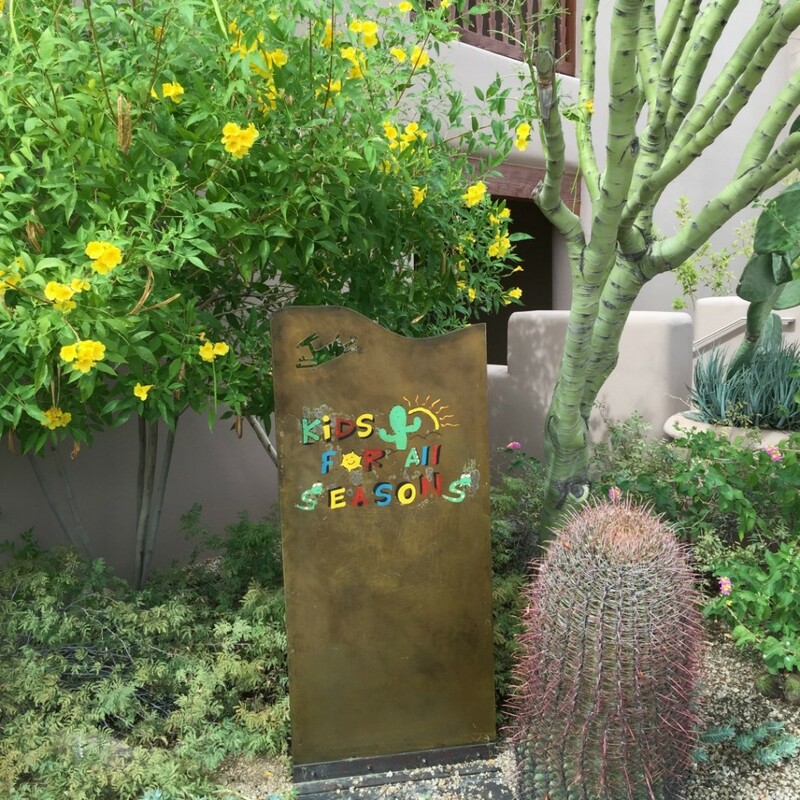 If you are wondering what you might do with the kids while you go to the spa, Four Seasons Scottsdale has you covered with a complimentary Kids For All Seasons club. 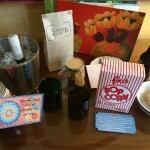 This is one of the best possible amenities a hotel can have as far as I’m concerned. My son loves visiting kid’s camps and enjoys the activities and meeting other kids. They have board games, video games, ping pong and also take the kids swimming, so it’s a nice mix of physical activity and down time. He has enjoyed several Kids For All Seasons in various locations and always has a great time. I usually have to drag him out when it’s time to leave, and this one was no exception. It’s a wonderful thing to be able to relax knowing your child is in great hands. Another thing I love about this particular club is that you are free to drop off and pick up your child as you see fit within the hours they are open. This flexibility allows for maximum usage of the program. 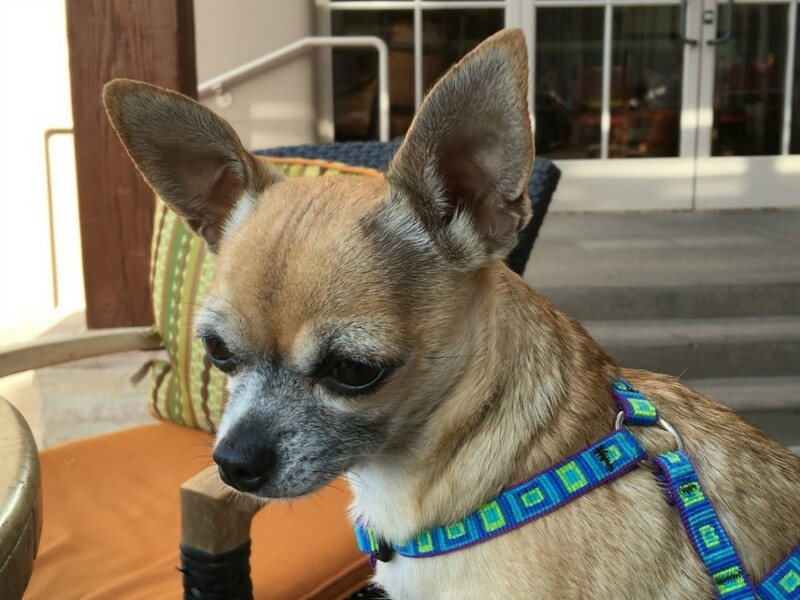 Four Seasons Scottsdale is dog friendly and does not charge a dog fee. 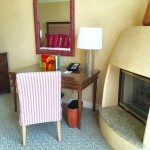 When you get to your room, you will find amenities for your dog, like bowls, bed and treats. 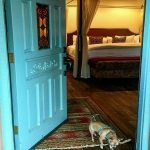 Our dog loves to travel and has figured out that with each new hotel comes new treats. 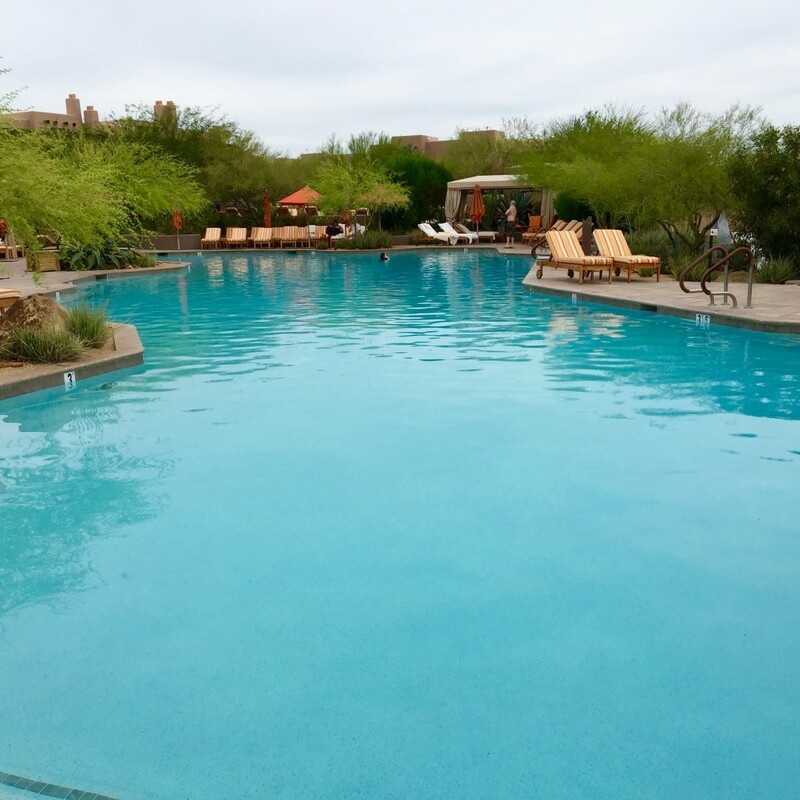 She loves exploring new places and the grounds at Four Seasons Scottsdale offer ample dog walking paths. 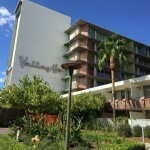 The Four Seasons Scottsdale is located in the north part of town. 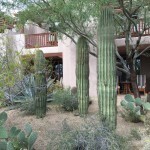 It’s close to the nature preserve and the setting makes you feel like you are experiencing real Arizona. There are hiking trails accessible on property, and you can take a short drive to find more. Views are fantastic from all directions. 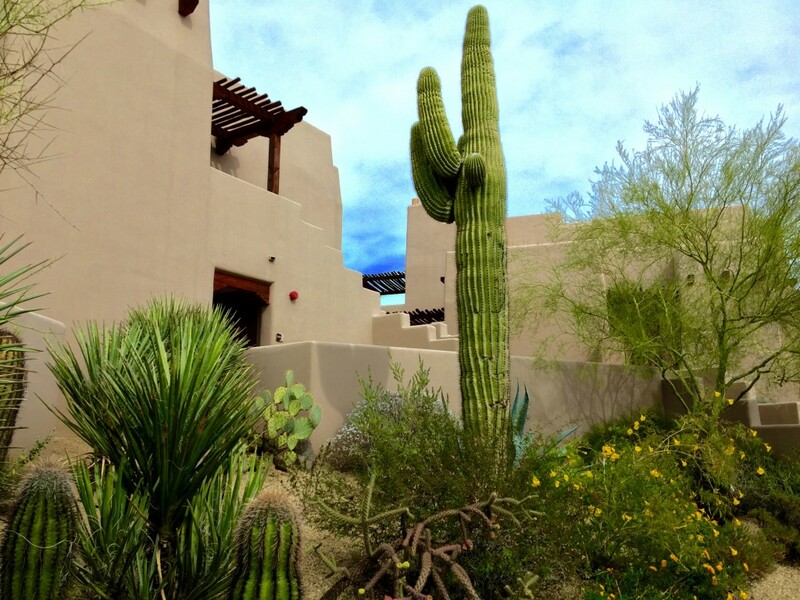 Big saguaro cacti, shrubs and boulders set against a bright blue sky are spectacularly beautiful. 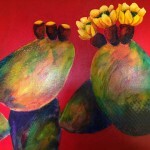 I’m fascinated by the saguaros. 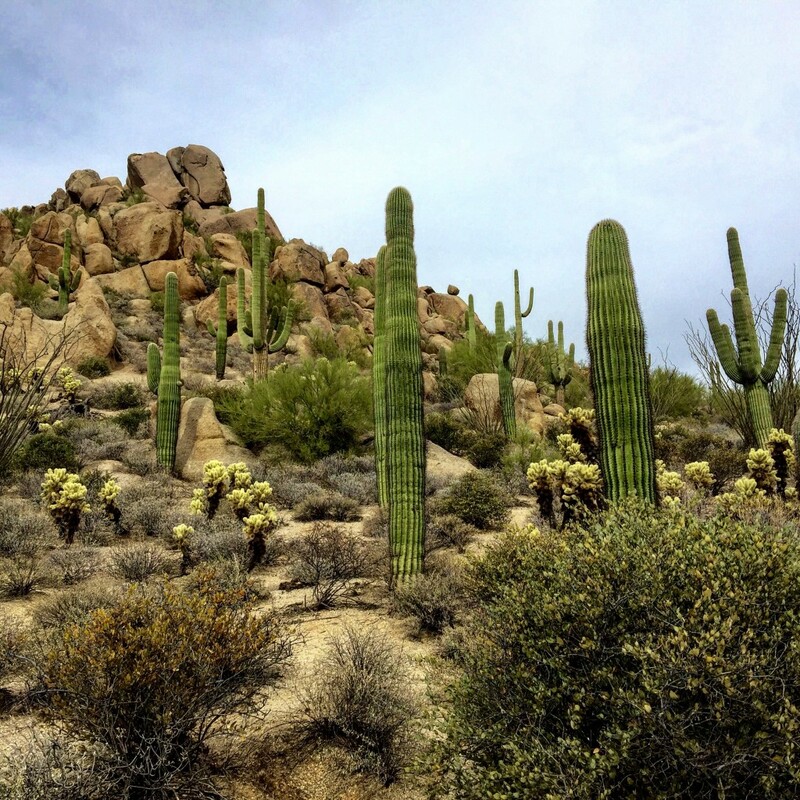 Did you know that it takes 70 years for a saguaro to grow an arm? 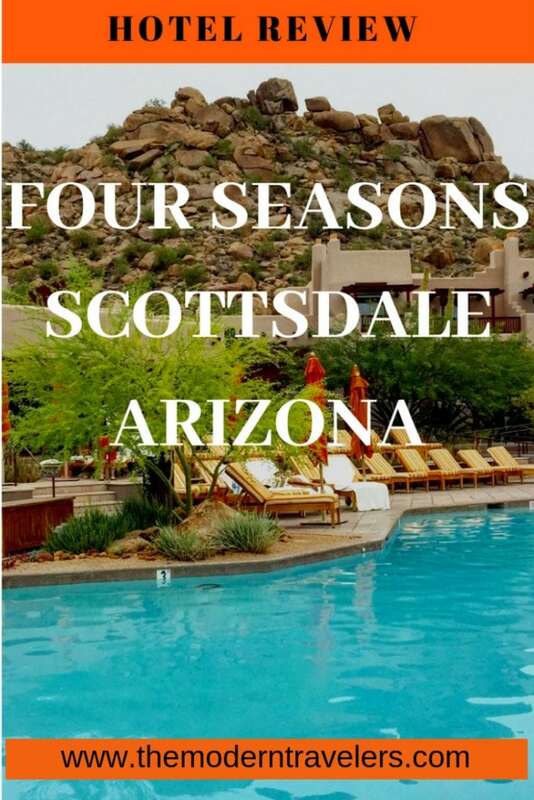 After you see how great the food is at Four Seasons Scottsdale, you may not want to go elsewhere for meals. 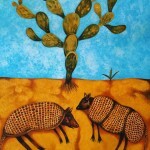 You have three excellent options: Saguaro Blossom, Talavera, and Proof. I love Proof so much, I’ve dedicated a separate post to it. 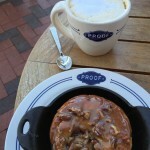 You can read about Proof, an American Canteen here. 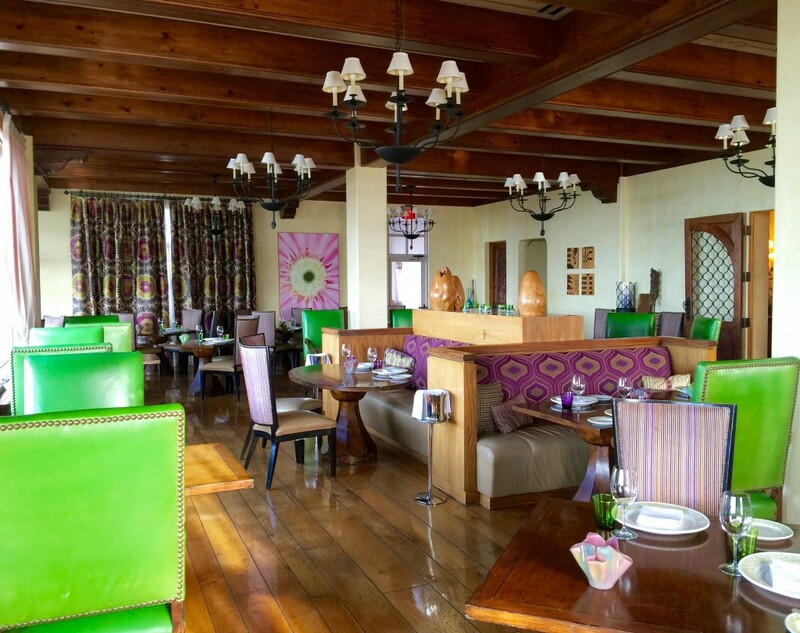 At the more upscale Talavera, the atmosphere is wonderful with an energetic green and purple color scheme, geometric patterns, wide plank wood floors, and the best part–a terrace where you can dine alfresco and watch the sun set. 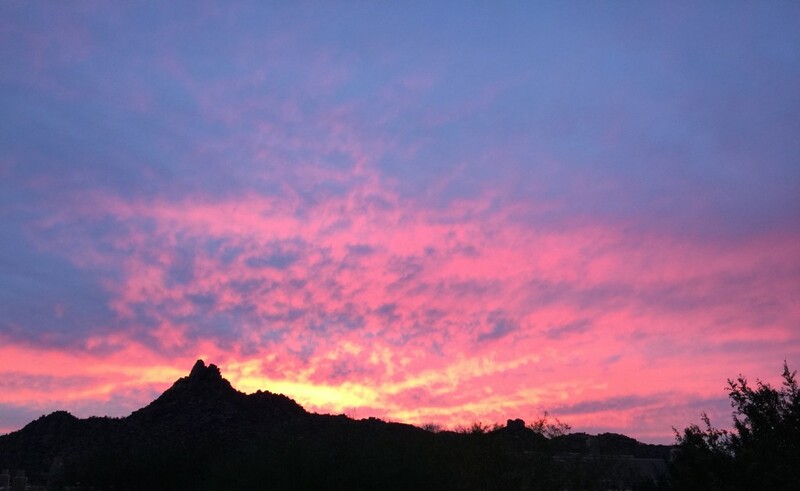 Talavera offers one of the best restaurants to view sunsets in Scottsdale. 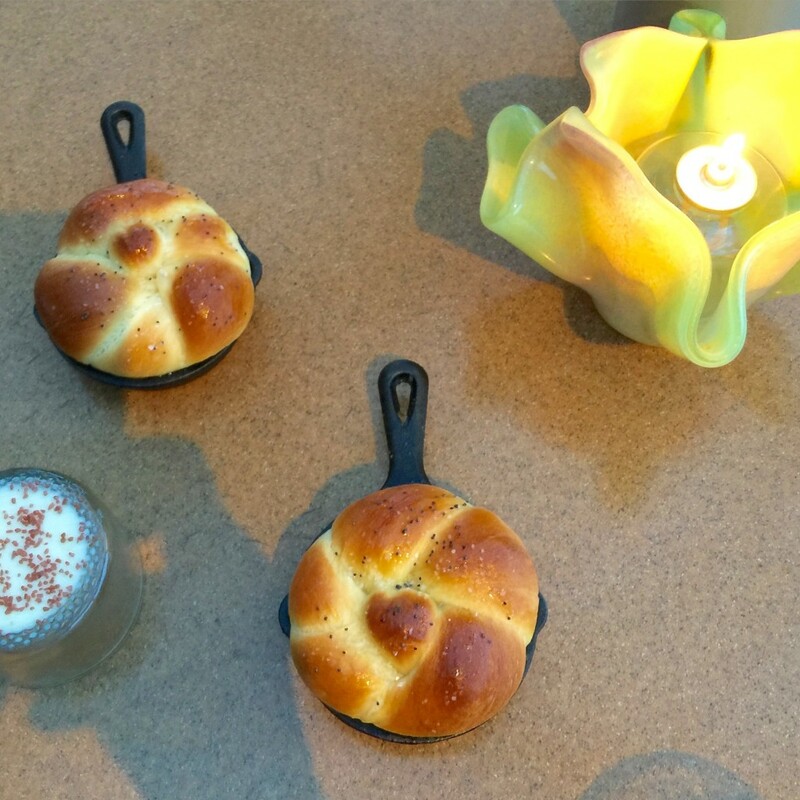 To start off the meal, they bring you hot fresh-from-the-oven home made bread served in little skillets. I warn you–this bread is fantastic and melts in your mouth. It’s easy to get carried away with it (I think my son ate three). You don’t want to get too full to experience the flavors to come. 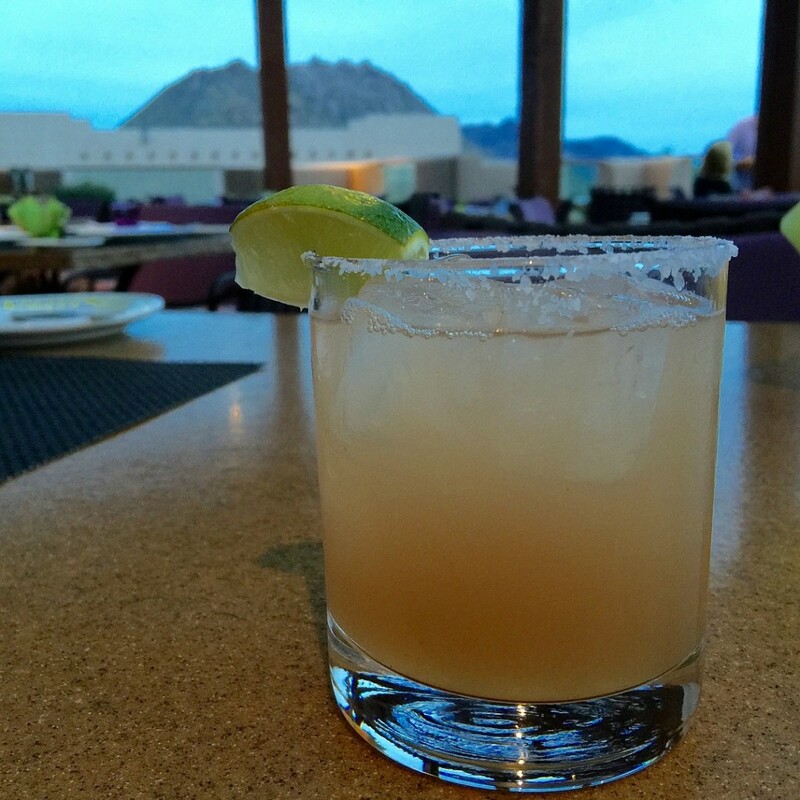 A Prickly Pear Margarita is the perfect pairing for the view, music and atmosphere. 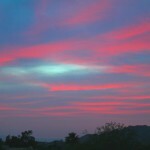 As the sun set, guests were oohing and ahhing as the sky turned different shades of pink, purple and red. 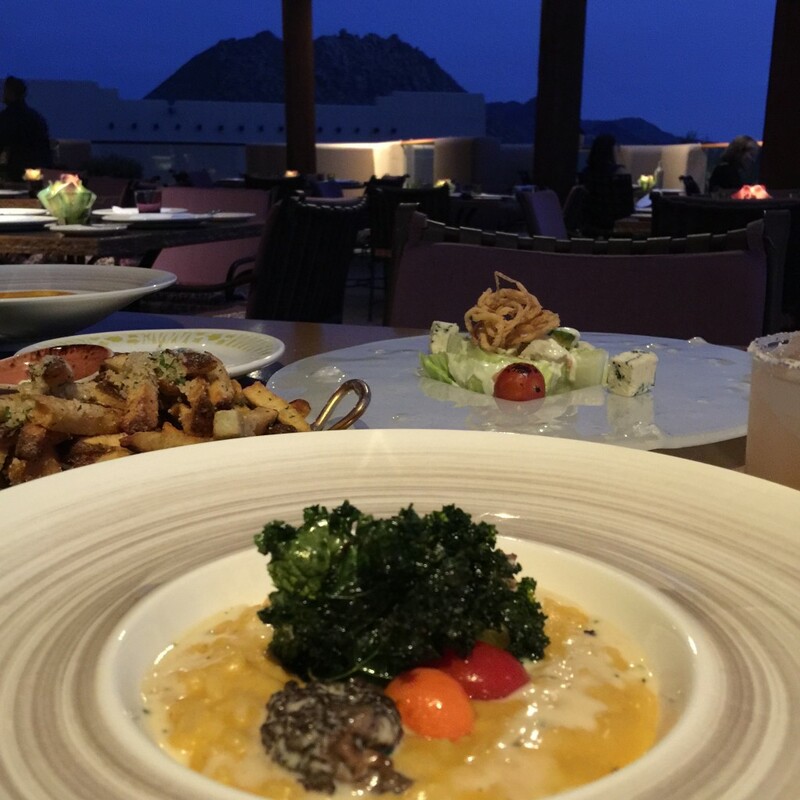 For the main course, we had excellent Butternut Squash Risotto with morels topped with crispy kale. It was buttery and creamy and I loved what was going on texturally with the kale. This went well with the Lettuce Wedge salad. 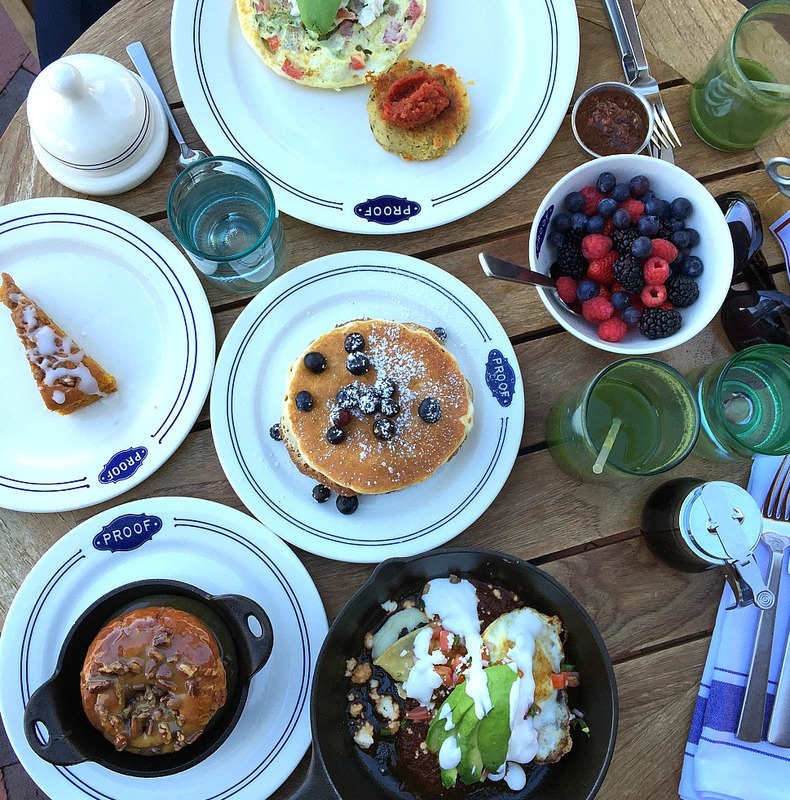 We needed half portions–which were plenty big enough. 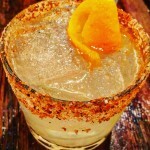 Talavera sources food locally and obtains the highest quality ingredients possible. This translates into great taste–farm fresh food is always better and the flavors pop right out at you. 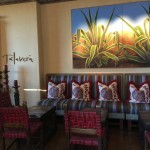 Talavera is a popular Scottsdale restaurant that draws people who are not staying at the hotel as well as guests. If you do stay here, you have to enjoy at least one dinner here. 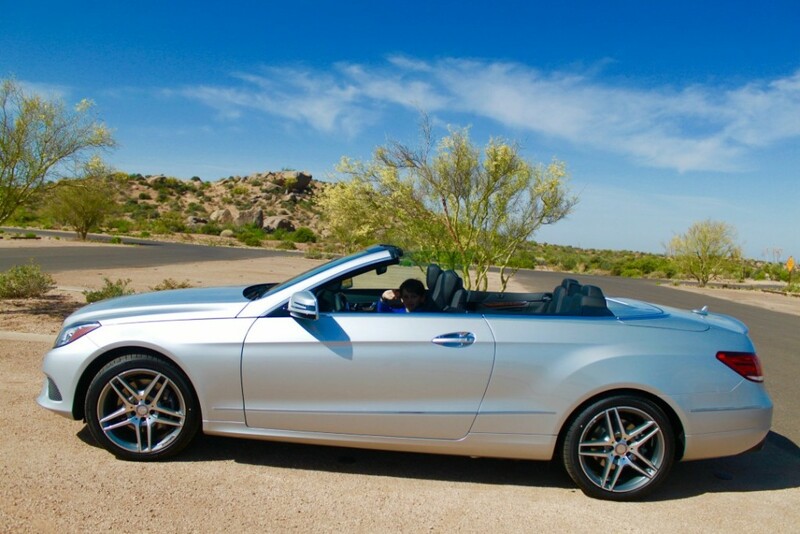 If you are a guest at Four Seasons Scottsdale, you have access to a complimentary Mercedes convertible. 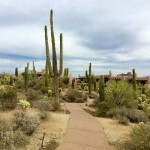 We used it to go to McDowell Sonoran Preserve to take a hike. All you have to do is request it (I would do that upon arrival if possible) and based on a first come, first served availability, you will have a beautiful car to drive. 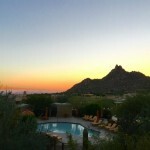 We were guests of Four Seasons Scottsdale, opinions are my own. 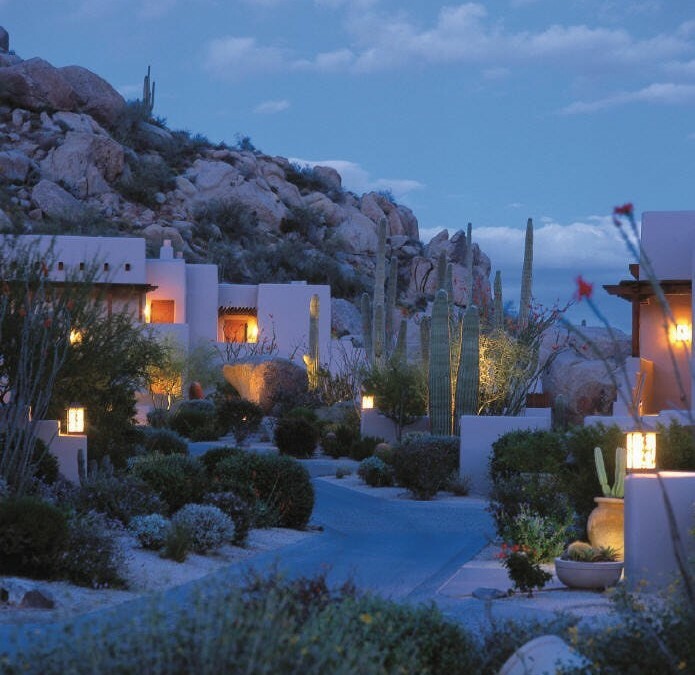 Twilight and Spa image courtesy of Four Seasons Scottsdale.